It’ll be action stations at the Department of Conservation’s quarantine store in Invercargill today as two expeditions check their belongings before heading down to the subantarctic on Tuesday, to ensure their gear is free of any possible introduced nasties. A 12-person team aboard the 25-metre yacht Evohe are off to the Auckland islands, and a 6-person team aboard the 15-metre yacht Tiama have Campbell Island in their sights. The aim of the ‘penguin flotilla’ is to count hoiho, or yellow-eyed penguins, to establish a good population estimate for the subantarctic, which is considered the stronghold for yellow-eyed penguin populations, although we don’t know how many penguins live there! A yellow-eyed penguin/hoiho on Enderby Island. 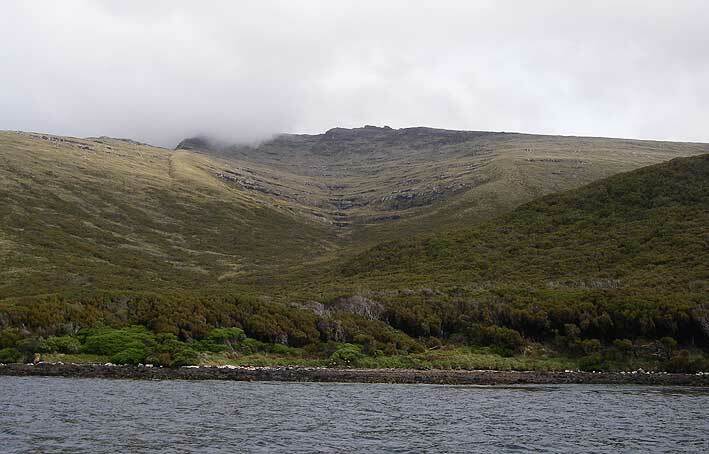 The last time a good survey of hoiho on Campbell Island was carried out was in the early 1990s, while there has only ever been an educated estimate of hoiho numbers on the Auckland islands, made in the late 1980s. Three years ago a joint DOC and Yellow-eyed Penguin Trust expedition braved a month of terrible winds and high seas around the Auckland islands to map every possible place that hoiho seemed to use as a breeding site, and this latest trip will build on that work. We’ll be locating ourselves at these sites, and spending a few hours from dawn each morning watching the coast, and counting hoiho as they travel between their nests and the sea. At this time year the subantarctic birds are incubating eggs (they’re a bit later than their mainland cousins, which is probably to due with colder temperatures and a differing food supply down there), and each pair takes turns sitting on the eggs and feeding at sea. It’s a bit like surveying commuters at a bus station, noting the numbers of arrivals and departures, although I suspect the Furious Fifties usual gale force winds, constant drizzle and low temperatures will make the job quite a lot colder and more unpleasant than any inner city bus survey! As well as counting yellow-eyed penguins the Campbell island team, led by Sandy King, will be using a specially trained rodent dog to make sure that the island is still rat-free, while another dog, this one trained to find birds, will be checking out theCampbell Island teal, to see how their numbers are doing since they were reintroduced a few years ago. The keen penguin watchers on the Auckland islands include Jo Hiscock, Dave Houston, Dave Agnew and Megan Willans, all DOC staff with lots of experience in both penguins and the subantarctic. Leith Thompson is a ranger with the Yellow-eyed Penguin Trust in Dunedin, and he spends much of his working days keeping an eye on the more than 500 breeding pairs of hoiho which call the Otago and Catlins coasts home. The other willing workers are six keen volunteers, who have each paid to be part of the trip, as it is a rare opportunity to spend time in the subantarctic. Sharon Karst and her husband sailed their yacht around the world, before settling at Matakana, north of Auckland, where Sharon has become dotty about New Zealand dotterels, helping out at the Tawharanui open sanctuary. Alan Magee is a retired engineer from Invercargill, and he’s particularly keen on geology and history, so will be taking every spare moment to immerse himself in the Auckland islands’ shipwreck stories. Marcy Taylor grew up on a farm and still works in the farming industry. She says she’s always been fascinated by the subantarctic and that this trip sounded like an amazing opportunity, too good to pass up. Katie Underwood works by day as Wellington real estate agent, but every moment of her spare time is filled with conservation volunteering, The Zealandia sanctuary is her usual stamping ground, but she’s also spent time weeding on Raoul Island. Alister Robinson is a funds manager who lives and works in Sydney but was Dunedin-born and bred. He volunteers on conservation projects in Australia, and has been building up his fitness for the trip with a few weeks of volunteer work at theOrokonui Sanctuary near Dunedin. Rachel Downey is from the UK, but now lives in Australia having got their via several years work in Antarctica. Sponges have been more her thing, but an introduction to penguins on the Antarctic peninsula got her yearning to learn more. That leaves me, Alison Ballance, the 12th member of the team. I co-produce and co-present Radio New Zealand’s weekly science and environment programme Our Changing World, I write books about natural history, and I spent four months on Campbell Island (in the middle of winter!) researching feral sheep for my master’s degree. This will be my 5th trip to the subantarctic and I can’t wait to be back. Of course there will be the usual problem – that small matter of 460 kilometres of sea between Bluff and the Auckland islands. My plan is to get on the boat and go straight to bed! When I emerge at the other end, and once we have started work, I’ll send another blog letting you know what our weather is like and how the penguin counting is going. I’ll also be posting blogs on the Yellow-eyed Penguin Trust web site – head to http://yellow-eyedpenguin.org.nz if you’d like to find out more. Two yacht-based wildlife expeditions are heading to Campbell Island and the Auckland Islands to conduct the first-ever comprehensive survey of yellow-eyed penguins in the subantarctic. The Department of Conservation led expeditions are expected to depart from Bluff on Tuesday 13 November if weather conditions are suitable. The yellow-eyed penguin or hoiho is found only in New Zealand, and is one of the rarest penguins in the world. There are just over 500 breeding pairs on mainland New Zealand, and it is thought that there are over a thousand breeding pairs in the subantarctic. As well as counting penguins the Campbell Island expedition will be using a trained rat dog to check that the island is still rodent-free. A trained teal dog will be used to find rare flightless Campbell Island teal, which were reintroduced to the island in 2005 after Norway rats were eradicated. The Auckland Island expedition is led by the Department of Conservation's Jo Hiscock with support from the Yellow-eyed Penguin Trust. The 12-person team, which includes six paying volunteers, will sail on the 25-metre yacht Evohe, skippered by Steve Kafka. 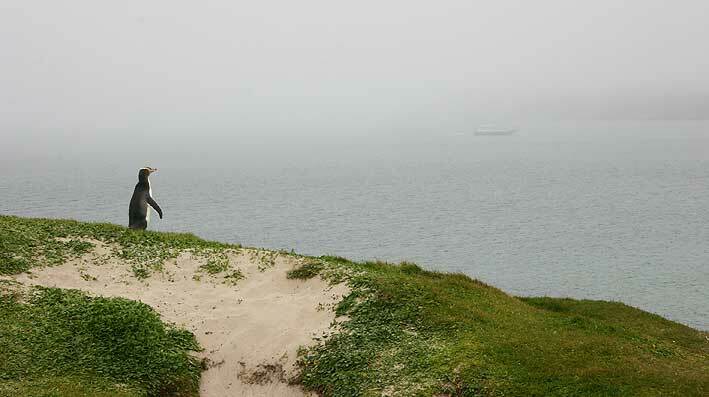 The Campbell Island expedition is led by Department of Conservation's Contractor Sandy King from Stewart Island. The 6-person team will sail on the 15-metre yacht Tiama, skippered by Henk Haazen.